Finally got a chance to get into the bee hives before Winter hit. This is the first winter in the Apiary and I am glad I had two hives. The operative word is that I had two hives. This fall the weather was wet and did not offer the opportunity to do many hive inspections. In general observations I was concerned about one hive as the amount of activity was not as active as I would have liked. This hammers home one of the tips my Bee Teacher made about having two hives. 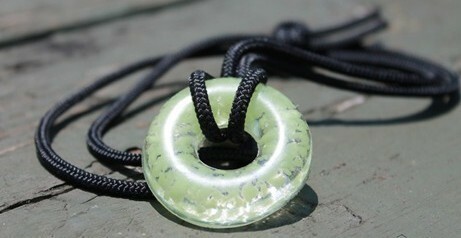 If you only had one it is hard to judge what is normal. 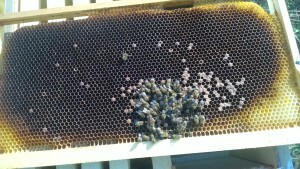 Just based on flight activity one hive was not bringing in the amount of pollen the other one was. We were fortunate to have Aster blooming up until the cold snaps and that allowed the bees to continue harvesting. Based on weight of the hives I believed there was no food issues. I really wanted to get a detailed hive inspection in before we had the first winter in the apiary. It confirmed that one hive was dead. During the inspection it appeared the cold might have gotten them on one of those cold mornings we had. 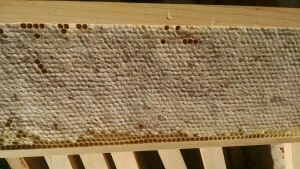 You can see some capped brood and workers that appear to be cleaning cells. The fact that the queen was there seems to indicate the hive perished. There was no evidence of any pests. I would be concerned about a lack of food as most of the brood frames look like the picture above. The super was full of capped honey. I decided to close off this hive and put the honey super on the other hive. They were quite active and bothered by the inspection. This being the first winter in the apiary I have one less hive than I wanted, however they have plenty of food.